Dubbed ‘the olive oil of the Americas,’ Avocado Oil comes from the ripe creamy avocado fruit and has a similar composition to olive oil. Like olive oil, virgin Avocado Oil is rich in monounsaturated fatty acids, low in saturated and polyunsaturated fats and high in antioxidants but it has more vitamin C, beta-sitosterol and chlorophyll. Unlike most edible oils that come from seeds, Avocado Oil is pressed from the oily pulp that surrounds the seed. Virgin Avocado Oil is emerald green, due to high levels of chlorophyll and carotenoids and it has a delicious nutty, mushroomy flavour. Avocado Oil is incredibly healthy because it is packed with nutrients like vitamins A, D and E, carotenoids, phytosterols, polyhydroxylated fatty alcohols (PFAs,) oleic acid, proteins, lecithin and as much or more CoQ10 than meat. CoQ10 is a vitamin-like substance which acts as an energy sponsor within the mitochondria and as a universal antioxidant. The PFAs in avocado are very unusual in land plants, making this fruit and its oil quite unique. 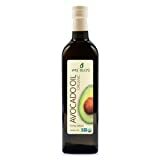 Fatty alcohols are anti-inflammatory, as are the phytosterols which make up a good proportion of Avocado Oil’s fats and the remarkable variety of carotenoids found in the oil. Besides the familiar carotenoids like beta-carotene, alpha-carotene and lutein, Avocado Oil also boasts the more unusual carotenoids neochrome, neoxanthin, chrysanthemaxanthin, beta-cryptoxanthin, zeaxanthin, and violaxanthin. These fat-soluble carotenoids depend on fat for absorption – which Avocado Oil supplies in abundance. The other anti-inflammatory components in Avocado Oil are the antioxidant minerals manganese, selenium and zinc and the flavonoids epicatechin and epigallocatechin 3-0-gallate. Avocado oil has anti-ageing, cholesterol lowering, cancer preventing and heart health benefits. The unique combination of anti-inflammatory nutrients makes it a good choice for preventing just about any chronic disease because inflammation is always a factor. It is especially beneficial to arthritis and osteoarthritis sufferers. It is good for eye health, diabetes and weight loss. Avocado Oil added to salads increases the absorption of carotenoids from other foods by up to 400%. 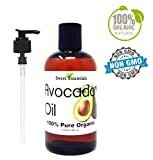 Cold pressed Avocado Oil is wonderful for dry skin. It leaves a fatty waxy layer on the surface that is antimicrobial and protective. Even though it is quite heavy, the fatty acids are similar to skin’s own sebum, so it penetrates deeper than most other oils and doesn’t clog pores. Hydrating, nourishing, softening, rejuvenating and exfoliating, Avocado Oil increases cell turnover – good for wrinkles, scars, redness, eczema, wounds, age spots and healthy, shiny hair. Avocado Oil is a very effective moisturiser and cleanser, especially for dry, damaged and ageing skin. It can be used on its own or added to other products to increase the absorption of nutrients. It also penetrates the hair shaft and strengthens hair when massaged into the scalp. Virgin Avocado Oil has a surprisingly high smoke point, higher than olive oil. It can be heated to 255°C without burning, making it ideal for cooking. It can be added to salads or used as a dip. Peel the grapefruit, remove the bitter pith and separate into segments. Chop the segments and place in a bowl. Mix together the Avocado Oil, the shallots and any grapefruit juice that has seeped out. Assemble the remaining ingredients in a bowl and add the oil mixture. Serve this lovely salad on a single serving plate or in individual cups. Variation: Add some cooked prawns. Put the clay in a small bowl and mix in the oils. Add some water, if necessary, to make a paste. Add a little more clay if the mixture is too runny. Spread over your face, avoiding the eye area. Leave on for 15 minutes. Rinse off with warm water and gently pat dry. Even when influenza is has set in, this blend of essential oils will help your immune system to deal with the virus. Put all the ingredients into a clean, 25ml bottle in precise quantities. Shake vigorously. Massage the abdomen and back with this mixture, in the morning and evening. You can also use this blend as a preventative measure once or twice a week. Note: Sweet Almond Oil can be used instead of Avocado Oil.